The overall response rate in advanced breast cancer patients treated with endocrine therapies is in the range of 30% [1, 2]. 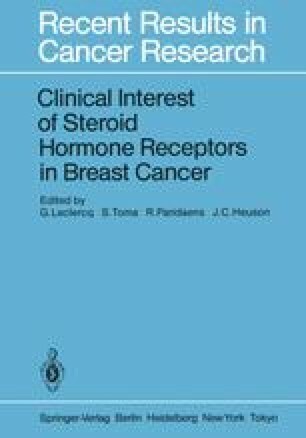 In recent years it has been demonstrated that response to various forms of endocrine treatment can be predicted in approximately 60% of cases provided that the patient’s tumor tissue contains the estrogen receptor (ER) protein . This response rate is in the same range as that obtained with cytotoxic therapy [1, 2]. Furthermore, a response to endocrine therapy seems to predict that a response to subsequent cytotoxic treatment will be of longer duration and lead to prolonged survival [4, 5]. Another aspect of endocrine therapy is that new remissions can be achieved when using subsequent endocrine therapies [6–11]. Therefore, taking into account the fact that treatment of patients with metastatic disease is, at best, palliative, it appears that there is a sound clinical rationale behind the use of the relatively nontoxic endocrine treatment modalities.